When will be Aussie Gold Hunters next episode air date? Is Aussie Gold Hunters renewed or cancelled? Where to countdown Aussie Gold Hunters air dates? Is Aussie Gold Hunters worth watching? In Aussie Gold Hunters, we join three hard-core crews of gold prospectors as they take the gamble of a lifetime and battle to strike it big, deep in the wild west of outback Australia.Over a dramatic eight-episode journey we'll share the soaring highs and crushing lows of the gold season as our crews pursue their all-important targets – braving brutal heat, punishing conditions, mechanical breakdowns and constant pressure.Just ask husband and wife team the ‘Gold Gypsies'. Six years ago, Christine and Greg Clark walked away from their Brisbane home and construction careers to chase their dream of striking it big, 4000km away in the West Australian Goldfields. Having spent their life savings to set up their mining operation, the self-taught prospectors' future rests on gold, for better or for worse…Thinking big are Vern Strange and Leon Marsh, aka 'The Dirt Dogs'. These best mates have sunk a million dollars into their heavyweight mining operation. Its centerpiece is the Dogs' 45-ton dry blowing plant – named 'Goldzilla' – hand built to extract precious ounces of gold from hundreds of tons of raw dirt. Having ploughed one fortune into their season plan, the Dogs are under massive pressure to unearth another, just to break even…Meanwhile, remote prospectors Kellie Carter and Henri Chassaing are going it alone. Armed with their high techdetectors, the best friends seek their fortune out in the farthest depths of the wild outback – where rival prospectors fear to tread. It's a high risk, high reward plan - far off the map and hundreds of kilometres from help. But for Henri and Kellie, it's the only way to reach the precious undiscovered gold patches that could be hiding the ultimate reward. 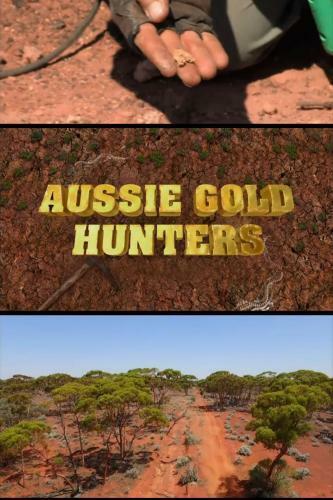 Aussie Gold Hunters next episode air date provides TVMaze for you. EpisoDate.com is your TV show guide to Countdown Aussie Gold Hunters Episode Air Dates and to stay in touch with Aussie Gold Hunters next episode Air Date and your others favorite TV Shows. Add the shows you like to a "Watchlist" and let the site take it from there.